Drones and dinosaurs may seem like an unlikely combination, but scientists in Australia are using present-day technology to track pre-historic footprints. The prints were laid in Western Australia about 130 million years ago. Taking advantage of modern technology, a team of paleontologists from the University of Queensland is using low-flying drones to get a bird's eye view of dinosaur tracks which are preserved in stone in a 200km stretch of the West Kimberley coast. This vantage point is hugely beneficial, as the footsteps are often hidden by jagged rock and are therefore difficult to identify. "It's allowing us to get up above some of the more interesting track sites, and get lots of good video footage, which is really exciting, and lots of fun,” team leader Steve Salisbury told the Australian Broadcasting Corporation. That footage will be processed through software, providing researchers with 3D imagery of the paths of sauropods, and potentially theropods. 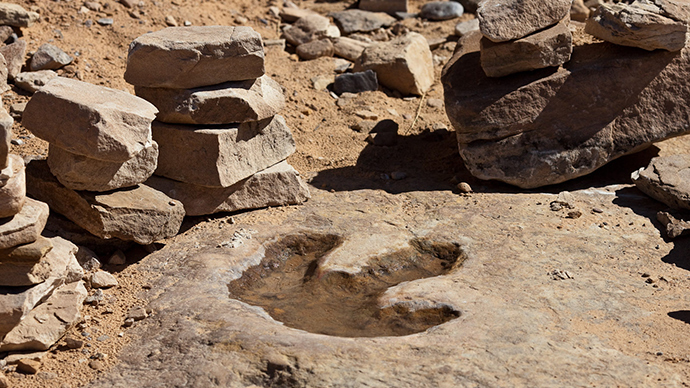 The different types of prints are easily distinguishable – sauropods left behind circular imprints and theropods made their mark with bird-like, three-toed tracks. The fossilized footprints stretch from the coastal town of Broome to James Price Point, 60km north. Although some of the dinosaur tracks are well-known, others have been kept secret by local Aboriginal people and scientists, who feared they could be stolen or vandalized. Such concern wasn't unwarranted – one dinosaur print was drilled from rock to be sold on the black market in the 1990s. The footprints are part of the mythology of the local Yawuru people, who say they are keen to have the prints documented if it leads to better management and protection. But some of the tracks are being discovered for the very first time, millions of years after they were laid. "There are a couple of new ones that have emerged on this trip, and sometimes it's just mind-blowing just how much there is to document," Salisbury said. But there's more to the documentation than one might think. The team has to battle with the area's enormous tides, which erode footprints and dictate when scientists can work. In fact, Salisbury says some of the areas are exposed for just a few hours, a few days a year. “We don’t get many chances,” he said earlier this month. The drone usage is part of the government-funded 'Walking with Dinosaurs in the Kimberley' project, which is scheduled to wrap up by the end of 2016.